“Why cultivate a deeper knowledge of yoga, science, the body, mind and nervous systems? I often get this question from yoga teachers. Honestly, my first answer is because our 200 hour training is meant to be a starting point, a jumping board, so to say. This is where we begin our infancy of exploration. True, that not all teachers or students are interested in deepening their knowledge and that is a personal choice. However, if we are going to be supporting space for students and ourselves to safely practice, should we not be interested in what might come next? This was and still is, a personal path for me, in getting to know the system of the body, more intimately. We will never be able to completely protect students from injury, but should we not be armed with the most pertinent and up to date information on what might be occurring when we practice? I am passionate about helping those interested, in deepening their knowledge. What do we know? What do we honestly not know, in the scientific community? If we are not careful, we may just be throwing out words in classes to create a confusing “word salad”. I believe that part of this practice is to be honest and to not cause harm, to the best of our ability, the most valued precepts in spiritual practice. In my 300 hour training I have taken the time to really go over the research, to speak with my master teachers and study with them. I have also spent over 20 years working with and healing my own body as well as seeing beautiful results in my students and private clients. Did you know that therapeutic yoga can help complete OT and PT for those with injuries? These practices help to create the holistic pieces of healing that are not always addressed in other modalities of rehab. How does our breathing affect pain in the spine? How does the health of the fascia affect the health of our internal organs? Are we sure about what we think a stretch is? And what is the science out there behind rehab, alignment theories, biomechanics principles and the toning of the Vagus nerve for overall health and wellness? In this 300 hour advanced training we have a great time learning about these questions and so much more. My interest is in opening the discussions about what we know now, think we know, and what we really have not measured to have an answer. The mysteries of this body/heart/mind are so very interesting. To dive more deeply, we must inhabit our own body systems, as herein lies our personal truths, the innate wisdom. During the core 300 hour as well as the individual weekends, open to the public, we will dive in through movement, lecture, reading, practice, meditation and lots of fun hands on work. We grow into a sweet sangha, all exploring for the wellness of ourselves and for others. We develop the eye to see what might be called for with individual students as well as in a group class and how to adjust for this, with confidence and compassion. 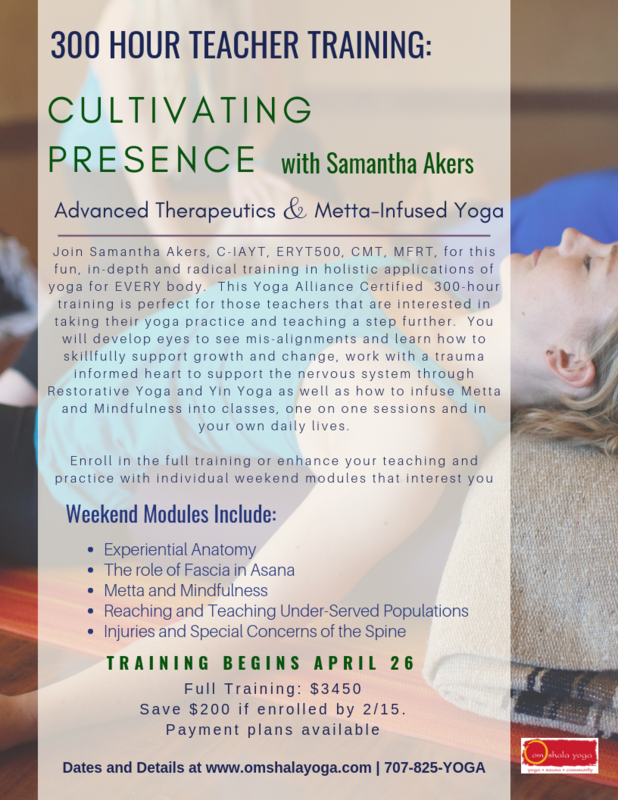 My promise is that this will be a “meaty” and fun experience, where you will learn more than you thought possible and leave with the excitement and passion for sharing holistic healing through the lens of yoga and meditation. If you believe you might be ready to dive into the body/heart/mind as well as the scientific research that is most current, be playful, hold space for your own healing and growth, this may just be the training for you. Together, we will love, live, learn. I cannot wait to begin. Click here for more information on our upcoming 300 hour training.